It’s official. This year’s flu season is now the worse we’ve seen in almost a decade since the swine flu pandemic; health officials said last Friday. The CDC reported fatal cases including the pediatric deaths of 37 children. If you think the season is almost over, then think again. According to the CDC, influenza activity often increases in October and November and peaks between December and March and can last as late as May. The silver lining for those of us who live in California? The CDC is seeing some signs of the flu declining in the West. Probiotics – Healthy gut = healthy immune system. Period! Good gut bacteria helps fight off viruses and bad bacteria that end up in your gastrointestinal tract. Yogurt, sauerkraut, and miso are just a few examples of foods that provide these benefits. Leafy greens – People think that drinking orange juice is great for vitamin C, but you’re better off cutting out excessive sugar and going with leafy greens such as kale and bok choy. Both are brimming with this helpful antioxidant. Ginger – Ginger has been found to protect the body from disease. Its antibacterial and anti-inflammatory properties help balance the immune system and restore its proper function. 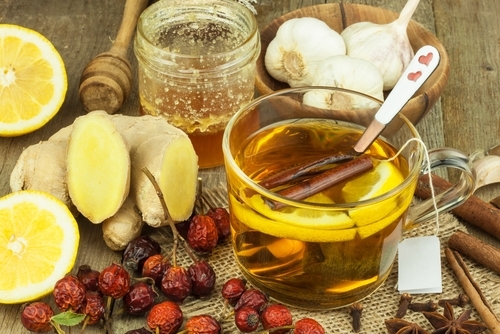 We make fresh ginger tea at the onset of a cold and have avoided getting sick 97% of the time… honestly! Chickpeas – Did you know that a zinc deficiency could decrease your immunity? Red meat and chicken are traditional sources of zinc, but this plant-based legume has far better nutritional value. It’s a great source of zinc, AND it improves digestion (thanks to the high-fiber content). It’s also an excellent source of protein, and other essential vitamins and minerals. Garlic – It’s difficult for the body to absorb zinc, but garlic contains sulfur which can assist the body with zinc absorption. One study found that garlic prevented subjects from catching a cold and even shortened the duration of most colds. Cold-Water Fish – When influenza strikes, the immune system can cause the lungs to become inflamed, which may result in difficulty breathing. Loaded with omega-3 fatty acids, cold-water fish like salmon, sardines, and tuna can help reduce inflammation. For a vegetarian alternative, try walnuts, chia seeds and flaxseeds. Mushrooms – Vitamin D is critical for the body’s immune system, and mushrooms are one of the few foods that have it! You can reduce your chances of getting sick as long as you take all the necessary precautions on a daily basis. “Get adequate rest, nutrition, don’t smoke, and keep your allergies controlled, because if they’re out of control, then your upper respiratory tree is already inflamed, which sets it up to more easily acquire a virus,” says Ardis Dee Hoven, MD, an infectious disease specialist on WebMD. For more ideas on immunity-boosting foods, follow The Lunch MOB on Facebook, Twitter, and Instagram. We often spend weeks if not months preparing for the holidays. But while we make great effort planning our menus, gifts, and agendas, we don’t usually have a strategy on how to stay balanced and healthy. For most, self-control goes out the door. We not only overindulge in rich, fatty foods, but we end up sacrificing our exercise time to get through our to-do-lists. All in all, it’s a recipe for disaster. When we consume unhealthy foods we don’t have time to burn off, it makes us feel guilty and sometimes even physically ill. This isn’t exactly an ideal state to be in when you have so many things to accomplish during the holidays. So what can your family do to have a more enjoyable and joyful holiday season? Here are some of our tips. Even if you only pick a few, you’ll be in much better shape (literally!). The holiday season may not feel the same without bingeing on eggnog and gingerbread cookies. Instead of giving in to your yearly cravings, however, try focusing on other traditions not centered around food like Christmas caroling or tree trimming. It’s more important than ever to keep your kitchen stocked with healthy options especially snacks. Instead of focusing on what you can’t eat, promise to eat the five recommended servings of fruits and vegetables per day so you fill up on nutritious foods rather than empty calories. Keep that water bottle handy at all times. Remember, you may feel hungry when you’re really dehydrated so make sure you drink at least eight, 8 oz. glasses of water each day. This is one of our favorite tips if you can manage it. We all can expect to be overly busy during the holidays. Instead of resorting to takeout or filling up on sweets, stock up your freezer with healthy meals. We love throwing this butternut squash soup or skinny baked macaroni and cheese in the freezer. Just make big batches the next time you’ve got the energy. You’ll thank yourself later when all you have to do is pop a dish in the oven… gives you more time to be merry! Skip the store-bought cookies and save your calories for homemade treats or fancy sweets that are special to you. Don’t deprive yourself as your willpower may eventually snap, but do exercise some restraint and know what your limits are. Remember how good you feel after sweating and doing cardio? Or the wellness that yoga brings? All those endorphins and positive vibes you create after exercising is the best possible antidote for holiday stress. Period. Set realistic expectations for yourself and your family. Overscheduling, often times, is the root cause of stress. As much as we love pleasing others, we also need to give ourselves some TLC. Don’t beat yourself up if you don’t nail that recipe from the Food Network or that centerpiece you pinned on Pinterest. If there’s anything The Lunch MOB can do to lighten your load during the holidays, please feel free to reach out to us! We’re always open to your suggestions. Who knew that certain foods can help build memory stem cells, improve mental skills, and promote better focus? Now that back-to-school season is upon us, we rounded up these top brain foods to keep your kids sharp for the school year. Here at The Lunch MOB, many of the foods we prepare naturally incorporate superfoods. A few examples for the months of August and September include our Crunchy Fish Soft Tacos, Brown Rice & Bean Burrito, Cobb Salad, our famous “Good Morning” Breakfast Sandwich, Banana Oat Snack Bites, Mixed Berry and Yogurt Parfait, and BBQ Kale Chips. Eggs – Protein is an important building block of bones, muscles, cartilage, skin, and blood. Eggs are a protein powerhouse, but did you know their yolks are rich in choline, which is vital for the creation of memory stem cells? Fish – Fatty fish such as salmon is an excellent source of omega-3 fatty acids and are essential for brain growth and function. Research has shown that omega-3’s protect the brain from memory loss, improves mental skills, and promotes better focus. Berries – Strawberries, cherries, blackberries, and blueberries boast high levels of antioxidants and vitamin C. As a rule of thumb, the more intense the color of the berry, the more nutrition it has. Leafy Greens – Eating spinach, kale, Swiss chard, arugula and romaine lettuce are linked to lower odds of dementia later in life. They are full of nutrients like vitamin K, folate, and beta-carotene which are linked to slowing cognitive decline. Milk & Yogurt – Dairy foods are an excellent source of protein and B-vitamins, which are essential for the growth of brain tissue, neurotransmitters, and enzymes. They are also rich in calcium, which plays an important role in regulating our body’s energy. Nuts & Seeds – Loaded with essential fatty acids, vitamins, minerals, and protein, nuts help boost our moods and keep nervous systems in check. Peanut butter, for example, is a great source of vitamin E and thiamin, which helps the brain and nervous system use glucose for energy. Beans – A fantastic source of protein, complex carbs, fiber, vitamins and minerals, beans keep energy levels high. Kidney and pinto beans, especially, are a great source of omega-3’s. Oatmeal – Oats and oatmeal are an ideal source of brain fuel. Because they keep kids feeling fuller longer, they provide a nice, steady stream of energy to help children focus. A study even showed that kids who ate oatmeal performed better on memory-related school tasks than those who ate sugary cereal! Kids aren’t the only ones who can benefit from eating “brain foods.” Scientists have discovered that adults too can grow new brain cells throughout their lifetime. Sleep, exercise, adequate mental stimulation, and diet all play a role in sharpening the mind. 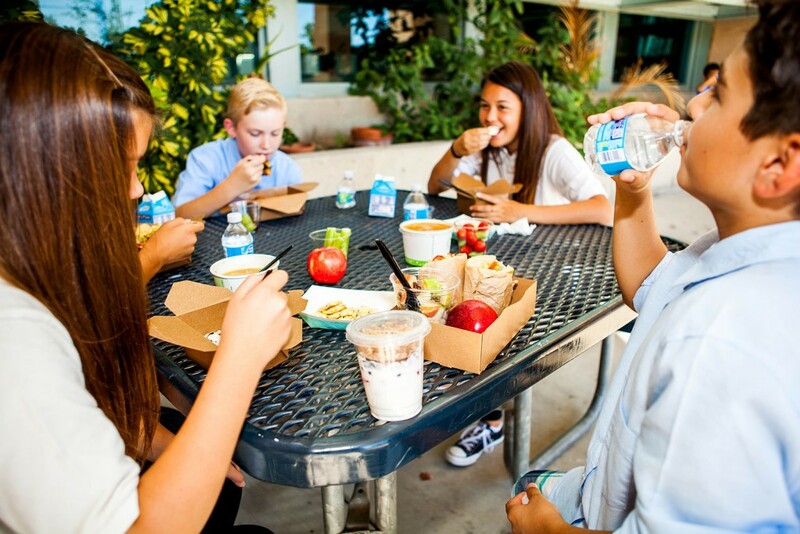 As a trusted school lunch provider, we can give your students (even staff) a fresher, more wholesome, and tastier hot lunch every day, hassle-free, while giving parents a heightened peace of mind knowing that healthier eating habits for their kids are being promoted. As parents ourselves, we know how important it is to ensure that our kids live a healthy lifestyle, and so, we made it our mission to create fresh meals that kids love, with the nutrition that kids need. Please reach out to us if you’d like more information about our offering! Congratulations! You’ve made it to the end of the school year and summer is right around the corner. Now the fun begins and weekends at the beach, pool time, and other outdoor shenanigans abound. What a wonderful time to make new memories with your family! And don’t worry if you don’t have any plans. Summer is a great time to explore and get creative. We love incorporating food into our summer activities. Not only is it a fun way to get kids excited about eating and drinking nutritious foods, but often times it’s an economical way to knock out some family bonding time. Ever notice how kids have more interest when they take an active role in the decision-making process? Try some of our favorite foodie activities this summer and let us know what you think! Visit a farmer’s market and ask your kids to pick out what they’d like to cook at home. Have a picnic at a state park. Make homemade pizza and incorporate lots of veggie toppings. Have a luau in the backyard. Bake your own cookies for ice cream sandwiches. Make ice cream. Try those ice cream balls you fill with ice cream base and kick around until frozen. Have a backyard campfire… or just use the grill! Roast hot dogs on sticks, pop popcorn and finish off with s’mores. Plan a picnic at a local park or in your backyard. Investigate an ethnic grocery store and make lunch using interesting spices and kid-friendly international recipes. Create unusual s’mores by experimenting with ingredients like bananas, strawberries, and dried fruit. Have a fancy tea party. The Lunch MOB is still fueling kids this summer and our kitchen is still open for business! If you live in Orange County, CA and have catering opportunities, please reach out. Lunch was the biggest, most important meal of the day before the Industrial Revolution. Back then, the midday meal was called dinner. Most adults worked near their homes and their children also went to nearby schools. Everyone returned home and shared this meal with their families. In the late 19th century, cities and factories grew and people worked further from home. Workers could no longer travel to eat so the concept of the cafeteria was born. An employee perk, this benefit helped improve productivity attracting hard-working employees to certain factories. Modern public schools looking to increase academic productivity took the same approach and began offering similar lunch programs. During the 1970’s, social scientists and nutrition experts found a correlation between diet and academic achievement. They started educating families about the importance of good nutrition. School lunch programs offered what you might see in cafeterias today: hamburgers, french fries, spaghetti, boiled vegetables, slices of pie and Jell-O. 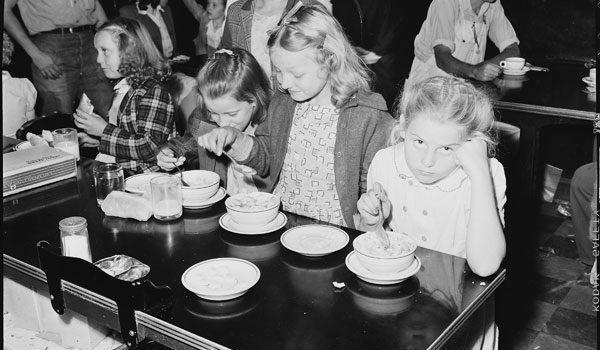 Over time, people debated the healthiness of the school lunch. The advocacy and implementation of improved standards increased. This helped boost the nutritional value of meals provided by schools. Today, schools can bring in specialty catering services like The Lunch MOB that goes above and beyond the status quo. Because we use fresh, wholesome, all-natural ingredients, parents never have to worry about harmful chemicals, additives, and artificial trans fats in their food. We incorporate organic produce whenever possible and make most of our sauces and dressings from scratch (so you can say goodbye to overly processed foods!). We know that eating healthy may sometimes add costs. However, we’re confident that you’ll see programs like The Lunch MOB as an investment in your family’s health and future. There’s a nationwide kick to get kids eating healthier in schools, and yet, the available choices just aren’t good enough to satisfy their tastes. By truly focusing on how ingredients are combined, we made it OUR mission to create fresh meals that kids love, with the nutrition they need. If you’d like further information about any of our ingredients or food prep practices, please reach out to us anytime. 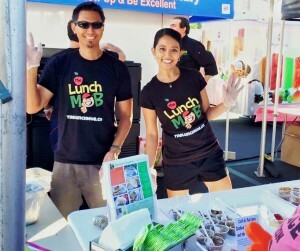 We’d like to hear from families and schools interested in partnering with The Lunch MOB in Orange County, CA. Irvine, Tustin, Laguna Hills, Laguna Beach, Laguna Niguel, Aliso Viejo, El Toro, Mission Viejo, Lake Forest, Foothill Ranch, Newport Beach, San Juan Capistrano, Orange, and Santa Ana– we’re talking to you! A year ago today, The Lunch MOB was born. The idea of making fresh, healthy food convenient for parents and kids finally took shape. Fast forward a year and The Lunch MOB has become a staple in Orange County, serving over 10,000 meals to many thankful students in their community. Today, The Lunch MOB is partnered with several private and public charter schools and they’re not slowing down anytime soon. In fact, the owners have vouched to continue donating a portion of their proceeds. For every meal that is purchased, a little something goes back to the schools. Did you know that this charitable model has been in practice since day one? Looking back, what are the founders of The Lunch MOB most proud of accomplishing in the last year? We took a concept, applied it to a new business idea, took some risks, and executed. I think it’s somewhat easy to come up with ideas, but it’s not so easy to build on it. There’s a lot of hard work and attention to detail that goes into running a business so we’re proud that we stayed diligent to get to the point we’re at today. Plus, we’re extremely proud of what we’re doing which is serving healthy, made-from-scratch, wholesome lunches to school children who may not necessarily be used to seeing this stuff in their own cafeterias or lunch boxes. Where does The Lunch MOB get its menu inspiration from? Honestly, I just find recipes of food that I like and adapt them to what I think kids would like (my kids are my guinea pigs too). While we have your standard grub like chicken strips, mac & cheese, and spaghetti, we like expanding our menu items to things that are not in your everyday repertoire. We also like getting creative with the help of our very experienced in-house chefs. What kind of feedback have you gotten from your customers? Feedback has been very positive. Parents, especially the busy ones, love us since we make things convenient through our website and mobile app. Everyone loves our daily selections and schools have even thanked us for being a better alternative. For me, since I hand out lunches at one of our schools, I get to see how excited and happy the kids are when they come running to my table to get their lunch trays. That’s pretty rewarding.